Cell Food increases cellular oxygen through its water splitting action, actually transforming some of the molecules within cellular cytoplasm and blood into nascent oxygen and hydrogen. Cell Food will actually increase the standing oxygen in a glass of water by up to 58% in less just a few minutes. It likewise increases cellular oxygen inside one’s body. Most people are also hydrogen deficient. Most people don’t think of hydrogen as an antioxidant, but that is what is behind sacred healing waters (because these waters bubble up through magnesium rock, they contain large amounts of hydrogen. Being so small, and therefore, able to access all parts of the body, hydrogen is an excellent antioxidant, and at the same time and in the same manner that Cell Food furnishes our cells with oxygen, it also furnishes our cells with hydrogen. Most people are deficient in minerals and enzymes, which are what allow our mitochondrial engines and tissues of the body to maintain themselves in good repair and what catalyze biochemical reactions. CellFood furnishes the body with numerous enzymes and over 78 trace minerals. Cellfood provides a steady flow of both oxygen and hydrogen — by splitting water molecules — in all parts of the body, producing simultaneous oxidation and reduction. Additionally, Cell Food enables the blood stream to deliver a minimum of 78 assimilable trace minerals and elements directly to each cell for complete and direct nutrition. Also, Cellfood aids in the digestive process. It contains enzymes and also is catalytic to the activation of the digestive enzymes. Finally, Cell Food assists in the cleansing of upper and lower intestines, by helping in restoring normal bowel functions. This effect will, most likely, begin to be noticed within 24 hours by those who need it. Cell Food reduces free radical damage. Persons taking Cell Food, at the rate of 8 drops three times a day, experience up to 27% less oxidative damage (CARR test). CellFood increases cellular respiration, the rate of conversion of fuel to energy. This manifests as less perceived effort to accomplish a given task. One measurement for this is an 11% drop in pulse while doing an aerobic exercise. Cellfood increases the number of white blood cells guarding one’s body by an average of 11%. The bottom line is your body functions better in terms of virtually every health marker with CellFood. Quantity discounts available: 3 to 9 plus units: 10%. Money Back Guarantee of Satisfaction on All Products. By taking eight drops of CellFood three times a day, at a cost of about $1.00 per day, you can help prevent oxygen deficiency in your cells and significantly reduce the amount of free radicals in your body. This will extend life, reduce inflammation and help defeat (before it starts) degenerative disease. How Should Cell Food Be Used? 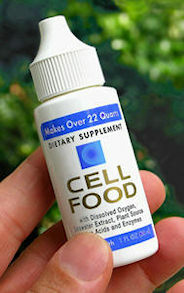 Cell Food is a liquid that one adds to any liquid or you can squirt it directly into your mouth (it has a lemony taste). The way it is normally used is to squirt 8 to 36 drops into any liquid and drink. This should be repeated two or more times a day. CellFood works its magic by splitting water molecules inside our cellular cytoplasm into nascent (newborn) oxygen and hydrogen for the next six to eight hours after being consumed.